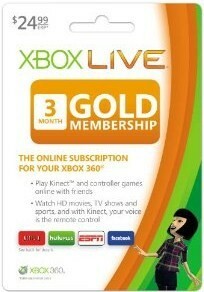 Xbox LIVE 3 Month Gold Membership only $12.99! Regularly $24.99! Hurry over to Amazon and get an Xbox LIVE 3-month Gold Membership for only $12.99! This regularly costs $24.99, and Walmart sells them for $22.30. NOTE: This is for a downloadable code! If you prefer a physical card, you'll have to pay for shipping unless you have Amazon Prime or buy $25 worth of eligible products. I'm guessing you could write the code onto a card or print it out and gift it....as long as it doesn't have a redemption expiration date!